Nature operates through complete integration and union of various forces, cycles and movements. Different players unite to provide a complete and most intricate setting that is this universe — stars, planets, sun, moon, and the seasons, all coordinated by the movements of the ocean, sun, moon and so on. Think of a balanced ecosystem as being exemplary of collective coexistence and human functioning. Not surprisingly, Nature intended microcosms at every level to be similar to and correlate withthe macrocosm — integrated and harmonious in every way. Human beings were meant to be completely united with each other through civilization and relationships. Each system and organ of the human body is designed to complement and supplement the others by performing unique sets of functions within each individual. It can thus be inferred that disintegration, or staying disconnected from the universal energy is perhaps against nature’s design. And often, it has consequences, whether at the microcosm or macrocosmic level. Our physical bodies also work collectively. When we experience a pain somewhere, our minds automatically tell our hands to try to alleviate the pain by holding, pressing or massaging the painful area. Our spirit or Inner Self is also seeking wholeness, or integration with the whole. Whether we’re able to perceive it or not, this is how nature designed human beings. The Inner Self is always trying to encourage us to achieve the Infinite by accessing higher states of existence — higher realms of consciousness. This is achieved or actualized during the Sahaja process of Self-Realization. Once we receive Self-Realization through Sahaja, the pulsation of our spirit can be felt on our central nervous system as vibrations on our hands. The practice of Sahaja is based entirely on subtlety. Sahaja works on the subtle inner energy within an intricate subtle system of energy centers (chakras) and channels (nadis). And collectivity, in the Sahaja context, truly means a subtle form of integration and coming together, or union. But it is not about physical congregation, grouping, gatherings or memberships. It is the unique phenomenon of each individual Sahaja practitioner reaching for and becoming part of the realm of higher consciousness. This realm is called as Collective Consciousness in Sahaja — also referred to by psychologists such as Carl Jung as the Collective Unconscious. When each person becomes part of this realm, that person is simultaneously in the higher state of consciousness known as thoughtless awareness. This realm is also synonymous with being in the true state of meditation, as well as having achieved true yoga or union with the all-pervading power of the universe. In fact, all of these are inseparable phenomena — either all of these happen at the same time or not at all. 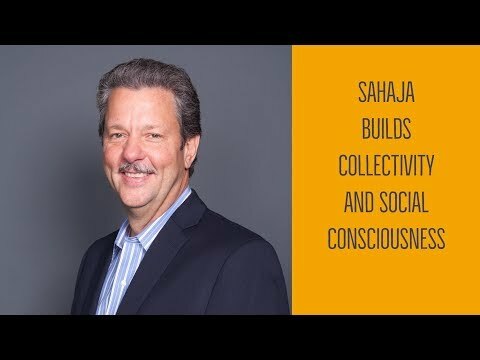 How does one become collective in Sahaja? So how do you become part of the Collective Consciousness in Sahaja? By raising your own individual Kundalini energy, getting it to rise up through the central energy channel, enter the brain and achieve a connection with the all-pervading power — a process that you undergo each time you achieve the state of thoughtless awareness in Sahaja meditation. In fact, the resulting state — Satchitananda — has been written about in depth in ancient Sanskrit scriptures. This state is the intersection of truth (Sat), the enlightened attention or consciousness that we experience on our central nervous system (Chit), and the joy (Ananda) experienced at the moment the Kundalini pierces the top of the head. In this moment, our consciousness is able to touch the collective consciousness. We’ve achieved collectivity and thoughtless awareness as well. Each time we meditate and “connect ourselves,” we are actually connecting our inner self to the realm of collective consciousness — sort of leaping into an ocean of the divine power. We become part of the collective, integral being, just as nature created us and intended us to be. Now, when we develop our sense of ego and superego, we move in the opposite direction. It’s exactly like a fish in the ocean that pops up out of water — it is no longer being integrated with the ocean. All human beings were, by design, meant to be collective and integrated spiritual beings, a part of the universal consciousness. As we lost our connections progressively in months and years after our birth, we became separated and disconnected from this collective realm. The Sahaja state is all about reconnecting and reintegrating so that we are in complete harmony with the universe, all human beings and nature, and with divinity. That is perfect collectivity. And in this perfect integrated form of subtle collectivity we can feel oneness with the universe and with all human beings who have also raised their consciousness to this higher state. Therefore, we are united through subtle collectivity; we can actually feel the vibrations of each another’s energy centers if we wish to. We may even be able to heal ourselves and others almost seamlessly because we’re an inseparable part of this powerful collective consciousness. Can you be “collective” while you’re meditating on your own? Surprisingly, the answer is yes. You are collective each time you achieve a connection to the Collective Consciousness — whether at home or while with a group. Yes, even when practiced at home individually, you can still achieve connectivity to the realm of Collective Consciousness. However, in a collective or group meditation session (such as a session led by an instructor on Sahaja Online), such a connection and union with this higher realm, achieved along with other people at the same instant, the connection is more powerful. Collectivity also makes it much easier for the practitioner to raise his / her individual energy. In fact, often, the energy seems to rise effortlessly, almost on its own, if the collective power of the group is significant. That’s exactly the reason why a collective connection to the Collective Consciousness realm is significantly more beneficial to each individual practitioner. When in this realm, practitioners are fully and completely integrated in their existence at that higher state. They can diagnose their own problems or others’ problems and find solutions. In other words, there are multiple benefits at the subtle level that each practitioner has. Sahaja practitioners frequently report “getting cleared out” after they attend collective meditation sessions, and often, especially when they’ve been finding it difficult to clear or remove the obstacles in their subtle energy systems individually. So while you’re technically connected to the collective consciousness whenever you meditate, the benefits and the power you can draw from meditating with a large group are so much greater. In fact, most practitioners find that merely having prolonged periods of individual meditation tends to weaken their individual connection, while group meditations tend to strengthen them. Think of your individual Kundalini energy as a single wire and collective meditation as a bunch of wires bound together within a large cable. Obviously, the power of the energy flow is much stronger with “multiple wires” or a collective of multiple meditators, and you are likely to receive a stronger recharge, compared to your “single wire” or individual meditation sessions at home. Is collectivity a must in Sahaja? Nothing in Sahaja is a must, really. While anecdotal evidence and recommendations from the vast majority of Sahaja practitioners indicate that collective meditation in large groups is highly beneficial, you are your own master, at every step of the journey. You decide when and where you want to meditate — at home or in a group. You evaluate the strength of your energy connection and the state of your energy centers. You decide what’s best for you. You figure out what size and setting of group meditation sessions works for you. But don’t be surprised if you reach the conclusion, based on your experience, that Collective Meditation is the single most powerful tool for recharging yourself. Since the type of collectivity we’re referring it to is entirely subtle and not dependent on a physical grouping, gathering or congregation, online meditation sessions through Sahaja Online are a perfect vehicle for collective meditation. Each person joining an online session establishes connectivity to the Collective Consciousness and the live instructor leading the sessions ensures that everyone is doing so at the same time. This, in fact, is a limitation with pre-recorded meditation sessions — you don’t get the collective power that you’ll get through a live session. And since online audiences are near-infinitely expandable, it’s easy to be part of large online audiences in any given session to maximize the benefits of collective meditation. And once the session has a global audience, that adds up to even more energy, coming from all across the globe. A stronger connection through collective meditation offers several key benefits. When you attend collective meditation sessions consistently, you get a number of longer-term benefits. Stronger experience of vibrations. Your sensitivity to feeling the energy improves quickly. A quicker, easier shift into the state of thoughtless awareness. Most practitioners report that it’s far easier to fall into thoughtless awareness in a collective meditation session than during individual meditations. Clearing out obstacles. The stronger connection through collectivity makes it easier for Kundalini to rise easily, and forcefully push out any obstacles in the subtle energy system. Deeper meditation. Collective meditation often results in deeper meditation. Most practitioner report reaching new levels of depth and stronger experiences in collective sessions, although such experiences are certainly also possible in individual sessions. Longer-term evolution. Collective meditation puts you firmly on the path of spiritual evolution and maturity. Due to the inherent nature of how collectivity works, human beings can only evolve and ascend collectively through access to the Collective Consciousness. The sooner you connect to the Collective Consciousness and the stronger that connection, the greater the odds of long-term improvement. A sustained effort for self-improvement through self-discipline is definitely needed also, but collective meditation sessions make this effort easier. Integrated personality. Ultimately, you are likely to feel that collective meditation keeps you in complete harmony with yourself, the people around you, and the universe. You become a balanced and integrated personality with fewer conflicts pulling you in different directions.